Heat oven to 375°F. Line large cookie sheet with Reynolds® Parchment Paper. In medium bowl, mix powdered sugar, peanut butter, cocoa, whipping cream and vanilla until well blended. Unroll dough on work surface; separate into 12 breadsticks. Pinch ends of 2 breadsticks together; repeat with remaining dough to make 6 long breadsticks. Press each breadstick to form 12x2-inch strip. Divide chocolate mixture into 12 equal portions, about 1 rounded tablespoon each. Roll each portion into 6-inch long rope. Place 2 ropes down center of each breadstick strip. 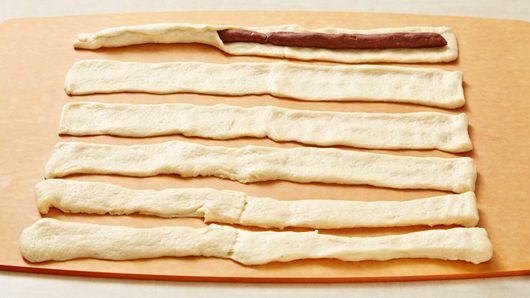 Fold dough lengthwise over chocolate ropes; press edges firmly to seal. Stretch each breadstick slightly. 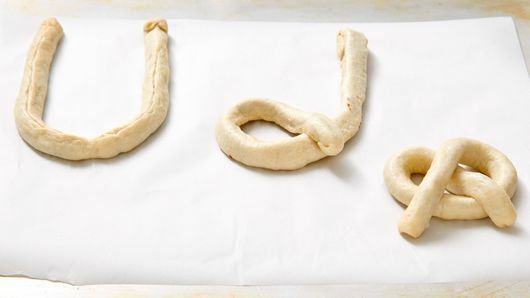 Shape rope into U-shape; cross ends, and place over bottom of U to form pretzel shape. Place seam side down on cookie sheet. Repeat with remaining chocolate ropes and breadstick strips. In small bowl, mix egg yolk and 1 teaspoon water with fork. 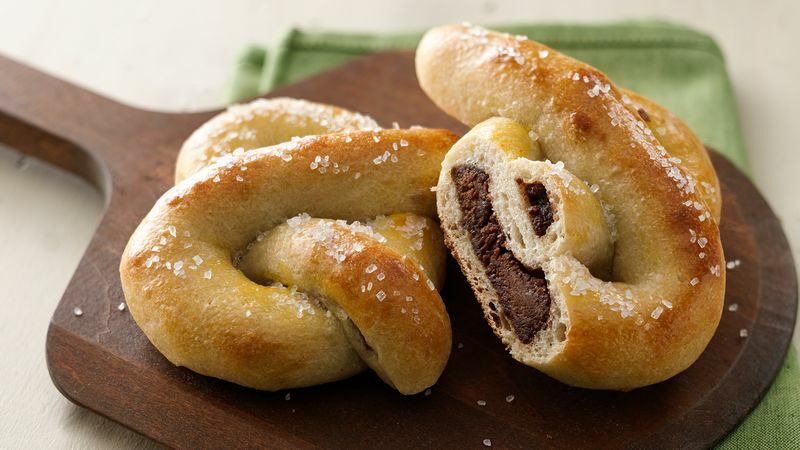 Lightly brush egg mixture over pretzels; sprinkle each with a pinch of kosher salt. Bake 13 to 18 minutes or until golden brown. Serve warm.